The Department of Public Works has been having meetings to solicit input on the redevelopment of land they own and use in Ivy City. They will be holding an open house on October 15th and sent the invitation below. To find more information on the project there is a one-page handout or you can look on-line at the Office of Planning website for additional postings. We hope that you can attend to give your voice to this development that will be on the north edge of Trinidad. 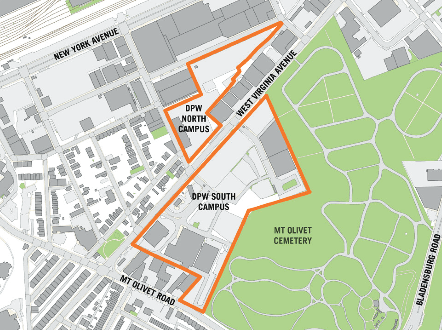 You are invited to a public open house on Thursday, October 15, 2015 at 6:30pm at the Department of Public Works offices at 1831 Fenwick Street NE to discuss the proposed improvements for the Public Works Campus at West Virginia Avenue NE. The District initiated the Public Works Campus Master Plan to explore the transformation of the Public Works Campus at West Virginia Avenue NE into a model of sustainable public works operations and a catalyst for community development. Over the past six months, the DC Office of Planning (OP) and the Department of General Services (DGS) have engaged Ward 5 residents and key stakeholders in Ivy City and Trinidad to create a blueprint for a new Public Works Campus with connections to the surrounding community. A variety of meetings were held during this time including a public open house, drop-in office hours, and a focus group, to collect community ideas and comments. Come learn more about the plan’s recommendations and find out how the proposed project responded to public feedback received at previous meetings. Please share this invitation (and the attached flyer) with your neighbors and other people or groups who you think would be interested in attending. If you would like any additional information on the project or have any questions, please feel free to reach out to Andrea Limauro in the Office of Planning at 202.442.7600 or email andrea.limauro@dc.gov. If you are unable to attend the meeting, the presentation will be posted on the Office of Planning website within 48 hours of the meeting: http://planning.dc.gov/public-works-campus. Posted on October 2, 2015, in Meetings and tagged DPW, West Virginia Ave. Bookmark the permalink. Leave a comment.